Treat yourself to the perfect balance of comfort and convenience at newly renovated Courtyard Fairfax Fair Oaks. As one of the premier hotels in Fairfax, VA, we are just 3 miles from George Mason University, near EagleBank Arena and less than 20 miles from Washington, D.C. Whether traveling for business or leisure, guests will find everything they need to make their visit a success. Stay connected with free Wi-Fi throughout our hotel, or grab a bite and beverage at The Bistro - Eat. Drink. Connect., open for breakfast and dinner in our contemporary lobby. When it comes to winding down, out hotel in Fairfax features spacious, modernly appointed guest rooms, complete with luxurious bedding and flat-panel TVs. For a more active escape, jump-start a workout in our state-of-the-art fitness center, or take a relaxing dip in our indoor pool. 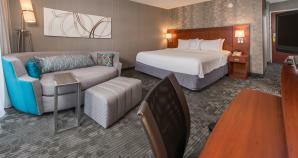 Additional hotel amenities include an outdoor fire pit, convenient business center and Boarding Pass printing station. Discover a new stay in Fairfax!